More tigers are kept as pets in the U.S. than roam free in the wild, campaigners say, as they call for tough new laws to ban the practice on International Tiger Day. While just 3,000 tigers inhabit forests across Asia and Russia, it’s estimated that as many as 5,000 are kept captive in small cages in U.S. backyards. “The main reason for all of these cats in backyards and basements and garages across America is that it’s legal for people to have their picture taken with a cute little tiger cub or lion cub,” Carole Baskin, founder and CEO of Big Cat Rescue, explains to CNN. “And those cubs are only cute and manageable until they’re about 12 weeks old. By the time they’re 13 weeks old, the people who are using them for these photo booths find that it costs $10,000 a year to take care of them, so they give them away. They sell them,” says Baskin. 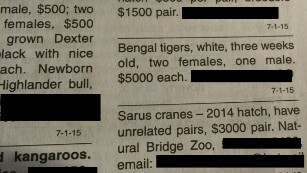 A newspaper advert selling tiger cubs in Florida, U.S.
And that cost is just for food and veterinary costs — not the maintenance of highly secure cages and facilities. The International Fund for Animal Welfare (IFAW), in conjunction with other animal protection organizations such as Big Cat Rescue, are calling on Congress to passThe Big Cats and Public Safety Protection Act, to end private possession and breeding of various big cats. Leigh Henry, Senior Policy Advisor at World Wildlife Fund (WWF), tells CNN: “The Act has failed to gain sufficient support to be moved through the legislative process in the past,” although she hopes that will change. “It is critical that the U.S. get a better handle on this population, and that we demonstrate conservation leadership to influence China, with an even larger captive tiger population, to take similar actions,” she adds. 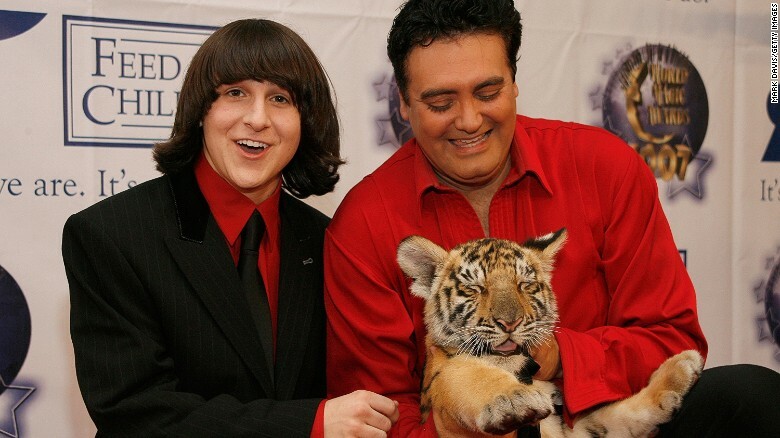 Actor Mitchel Musso (left) poses with Rick Thomas and Chaos the tiger at the 2007 World Magic Awards held at the Barker hanger on October 13, 2007 in Santa Monica, California. He says, captive tigers, for example, become larger than their owners and are often forced to spend their adult lives in cages. A rescuer of bobcats, also known as wildcats, since she was 17 years old, Baskin of Big Cat Rescue started receiving calls asking her to take in tigers and lions by people who couldn’t handle them any more. Living on five acres of land in Florida, in 1992 she bought 67 more acres to try to meet the ever-growing demand. In 2003, The Captive Wildlife Safety Act was passed, criminalizing the import, export, buying, selling, transporting, receiving and acquiring of certain big cats, with exemptions. After the law was passed, Baskin found that the number of calls she was getting from people desperate to offload their exotic pets dropped from around 312 to approximately 160. “We’re going to have to change the laws if we’re going to solve this problem,” Baskin says. There’s another serious problem other than profiteering from these animals — it’s suspected that some of the tigers may end up in the illegal wildlife trade for bones and parts, suggested to be worth hundreds of millions of dollars. When Baskin has accompanied the authorities on big cat raids and taken in the animals, she has usually found them in deplorable conditions. The tiger she took in belonged to Timothy Gress, 52, from Augusta, Georgia, who was relocating the exotic animals of his sanctuary, Augusta Conservation Education, which he began about 22 years ago while working full time as an electrician. Home to a lynx, cougar, leopards, ligers (tiger and lion hybrid), several big lions, a gray wolf and a black bear, Gress needed to wind down the operation as it had become too big to handle. 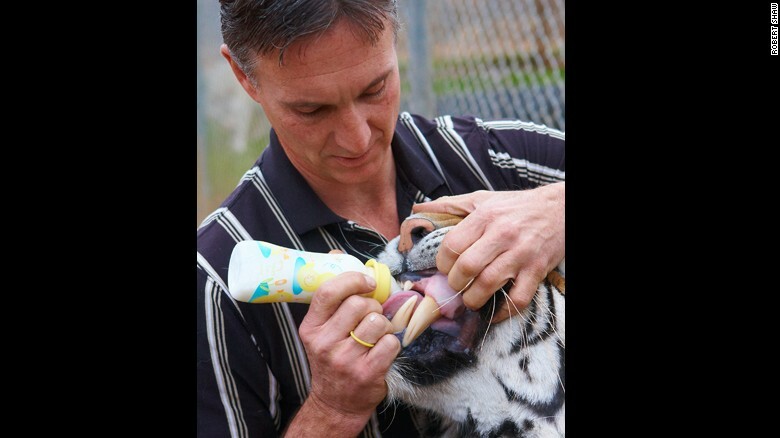 Tim Gress, 52, feeds Kali, a Bengal tiger, at the Augusta Conservation Education sanctuary in Augusta, Georgia, U.S. He rescued the big cat 15 years ago from a breeder who abandoned its mother in unsanitary conditions. Using his reliable contacts to successfully house all of his animals within six months, Big Cat Rescue took in his last animal — a female tiger called Kali, who was born to a mother who was abandoned in unsanitary conditions by a breeder 15 years ago. Gress argues that keeping an exotic pet should be allowed — as long as the owners know what they’re in for. He advocates training programs for anyone who wants to share their living space with a wild animal. “If they’re trained properly and you’re doing it for the right reasons, then you can successfully do things that makes their lives better,” he tells CNN. And he speaks passionately and at length about how to take care of such predators. Before entering a tiger cage, you have to greet the tiger, or “chuff” — the sound, he says, tigers make when they come across each other in the wild. ” …you don’t turn your back, you move in a circular motion in a corner of the pen. If they’re startled, then that means when you go inside, you’re probably not going to have a good experience,” he laughs. Gress maintains that he never bred, sold or commercially exploited his animals. “Anybody that breeds is not part of the solution. They’re part of the problem,” he says. However, many wildlife activists wish to discourage both ownership and breeding of wild cats. The proposed Big Cats and Public Safety Protection Act would ban both, if it gains enough political support. 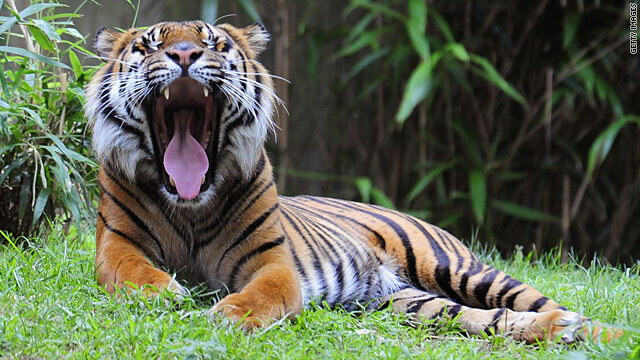 International Tiger Day falls annually on July 29, aimed to raise awareness of the endangered animal. Baskin believes the proposed bill could be the wild tiger’s redeemer. Although she says she carries out her duty without grudge, she wishes it wasn’t required. “All of us who are in the sanctuary industry want to put ourselves out of business.